Just a heads-up that this week is particularly difficult as I have to fit in, among other things, surveyors for probate valuations, solicitors regarding wills, and I have to travel to the depths of Kent to meet my sister and scatter my mum’s ashes. So although I will be working on orders on and off during the week, service will not be up to its usual speed. I had recovered to just a day or so behind, but I regret that this will lapse again: I expect to catch up just before I take some long-planned holiday and throw everything out of whack again. Janet will be at HQ while I am away, but because she doesn’t understand anything about toy soldiers please don’t expect sense from her if you phone. Thanks to everyone who has sent their condolences. It really is appreciated. Fighting 15s is gradually catching up with the backlog of orders and emails. Ian’s mum’s funeral was on 22 January, and he is not entirely clear of responsibilities in that regard. Last week, for example, lost a number of hours simply dealing with solicitors, and clearing up matters to do with the estate will continue to interrupt work over the next few months. Ian will be away shortly for the scattering of the ashes. By and large emails from early January onwards have now been answered or have been dealt with. Orders are five days or so behind, longer for those that require casting or that are waiting on stock to arrive. A shipment that arrived last week from AB/Eureka will resolve a number of those issues once it is checked and unpacked. Ian had hoped to do this over the weekend, but circumstances prevented this. Fighting 15s continues to deal with a large number of orders for its clearance lines (Oddzial Osmy, Laughing Monk, Shadowforge, Coat d’arms). Stocks are still by and large good, and codes that go out of stock are being removed as soon as possible from the online shop. Events over Christmas and the new year have helped clarify the direction that Fighting 15s will be taking in 2018. Owner Ian realizes that he is absolutely at his happiest selling the superb figures made by Tony Barton of AB Figures, and the figures produced by Nic Robson of Eureka Miniatures, and that it is time to make changes to Fighting 15s to focus on these manufacturers. Fighting 15s has therefore decided to discontinue supplying products from Oddzial Osmy, Shadowforge Miniatures, Laughing Monk and Coat D’arms. Items from these ranges are on sale at up to 20% off Fighting 15s’ usual prices. Our sale runs from today (12 January) until 5 April 2018, at which point the affected ranges will be removed from our shop. The last day that Fighting 15s will post orders before Christmas is 20 December 2017*. Family commitments and airport runs mean that although we will be around from 21 December, not much will happen in the workshop. We will be working at times during the holiday period to avoid having a massive backlog at the end of the festive season. Normality returns from Wednesday 3 January 2018. It is already too late to guarantee that items will be available in time for Christmas in the UK. Our main suppliers are based abroad and it is not possible to obtain anything that isn’t on one of our scheduled shipments. Our main suppliers also tend to shut completely for two weeks over the festive season. This impacts on shipments, and experience tells us that shipments from them will not resume until mid-February 2018 at the earliest. Items that we cast or make here in the UK ideally need to be ordered before 13 December for UK delivery before Christmas. As of 30 November, Fighting 15s cannot guarantee that orders from customers outside the UK will be fulfilled in time for Christmas. Standard airmail is slow enough at the best of times. *And yes, I appreciate that the Royal Mail’s recommended last posting date in the UK is 21 December, but I have family to pick up from an airport at a daft time of the day. Fighting 15s is at Claymore in Edinburgh on Saturday 5 August, helping out Stuart Armstrong on Colonel Bill’s stand. Although Ian will be Stuart’s till monkey for the day, advance orders are possible. As Colonel Bill’s carries our own medievals, Bartek’s playing cards, and Eureka’s Seven Years War ranges, Fighting 15s cannot take advance orders for those (which should be placed through Colonel Bill’s), but can take advance orders for other Eureka ranges, plus, of course, AB Figures’ 15mm Napoleonic and 20mm WWII ranges. A selection of ready-made 15mm Napoleonic unit packs from AB Figures will be available on the stand. Colonel Bill’s will continue to carry these packs at other UK shows, starting with Britcon. Time is running out for advance orders. Fighting 15s will shut from 2 to 9 August for holiday and to travel to and from Scotland, and therefore the last date for advance orders is Tuesday 1 August. Please note that orders that require extensive casting are now not likely to be ready in time – Ian has been casting for four days solid in preparation for the show as it is. The Fighting 15s online shop will, as usual, be open while Ian is away, but orders will not be processed until his return. Please do not expect his wife or daughter to answer questions about toy soldiers while he is away. Advance orders for Fighting 15s should be placed via email or, if you feel you absolutely must talk to a slightly deaf man, phone. Contact details are on the website. All advance orders must be paid for in advance by card or PayPal – Ian cannot take payments on the day. From August, it will be all change on how Fighting 15s deals with wargames shows in the UK as we expand our relationship with Colonel Bill’s. Since Salute in April this year, Ian of Fighting 15s has been helping out on the Colonel Bill’s stand, which means that 15mm AB Figures have been available to buy at selected shows. Our agreement with Eureka/AB, however, has meant that AB Figures can only be on the Colonel Bill’s stand while Ian is physically present, with the result that the figures have not been available at other shows. This situation will change in August. As a result of discussions with Tony Barton and Nic Robson, Colonel Bill’s will be able to carry 15mm AB Figures in prepackaged units to shows even if Fighting 15s is not helping out, meaning that AB’s fine 15mm Napoleonics will be available to buy at the 40 or so shows a year that Colonel Bill’s attends. Britcon in Manchester will be the first show to work this way. All the 15mm AB Figures sold this way will be licensed castings made by Ian at Fighting 15s, cast in lead-free pewter. Units will be sold in packs comprising 24 foot or 12 mounted figures. AB Figures, however, will not be available by mail order through Colonel Bill’s; Fighting 15s remains the EU mail order outlet. Ian, however, will still be attending shows and working on the Colonel Bill’s stand, according to Fighting 15s’ shows schedule. Ian is able to take advance orders for those shows only. The remaining shows that we plan to attend with Colonel Bill’s in 2017 include Claymore, Colours, Derby Worlds, SELWG, Crisis and Warfare. Fighting 15s’ ability to provide figures for Colonel Bill’s to take to shows relies on them being licensed castings made in the UK. Therefore items cast in Australia, including the whole of the 20mm WWII range of AB Figures, will not be available at shows except to advance order through Fighting 15s. 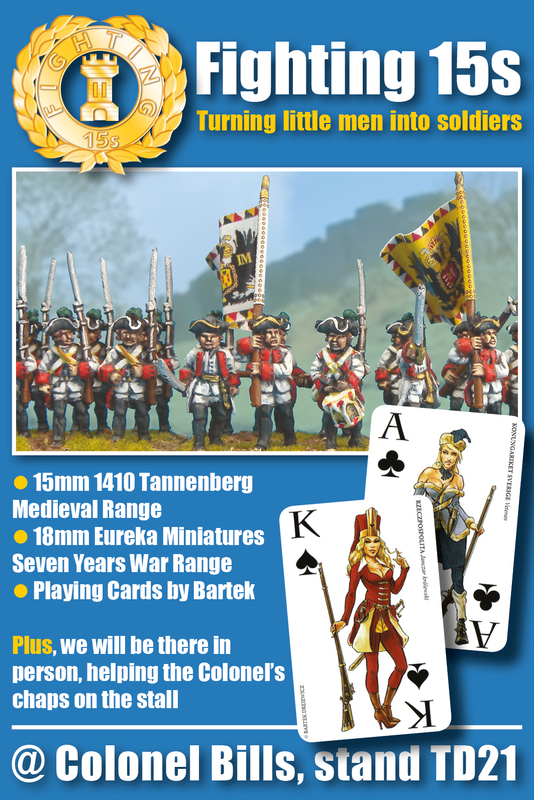 Colonel Bill’s remains Fighting 15s’ sole authorised outlet at shows for our own 15mm medievals, Eureka’s 18mm Seven Years War range, and Bartek’s pin-up playing cards, all of which can be ordered in advance for shows through Colonel Bill’s. I’ve starting running a series on my personal blog on the Saunders bob-weight spin casting machines I use at Fighting 15s. I’ve never been able to find out much about the machines, made by the now defunct N Saunders Metal Products Ltd. 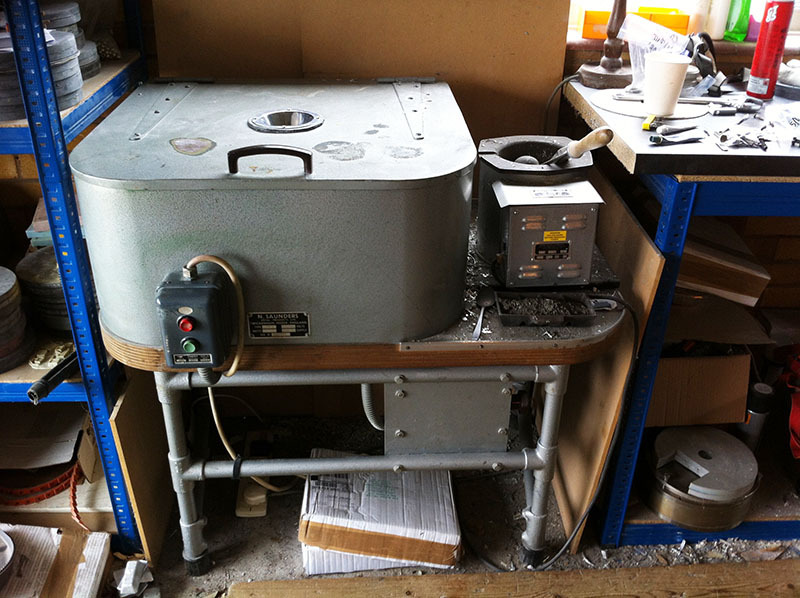 This is my personal experience of using them to get the best results, and the articles have been prompted by the acquisition of a second machine that needs repairing and refurbishing. Other users’ mileage may well vary. Part 5 will cover casting tips. Contrary to all expectations on my part, Fighting 15s will be at Salute 2017 on 22 April. I will be helping out Colonel Bill’s on stand TD21, and you’re welcome to pop along for a chat and to take a look at the ranges that Colonel Bill’s takes to UK shows on my behalf. Please contact Stuart at Colonel Bill’s to order Bartek’s playing cards, Eureka’s 18mm SYW and Fighting 15s’ 15mm medievals in advance. Fighting 15s will not have its own stock at Salute, however, Stuart has kindly allowed me to take advance orders for ranges other than those stocked by Colonel Bill’s: please place an order with Fighting 15s by email or by phone. Payment for all show orders with Fighting 15s must be in advance by card or PayPal as I cannot take card or cash payments on the day. This is to avoid any issue with cash or other payments going through the wrong till. There is no option in the online shop to collect at Salute. To place an advance order in the Fighting 15s shop, please choose the telephone payment option when checking out and phone to give payment details and to say that the order is for collection at Salute. Back in about 2010, Mystic Spirals sculpted some 28mm science fiction catgirls with a space pirate theme for Fighting 15s. Unfortunately, that project was put on a shelf, even though samples had been painted and the mould made. Spring cleaning for the online shop this month led to the discovery of the pictures for the range on an old hard disc and the unearthing of the mould. Despite the age of the sculpts, the range has now been uploaded to the shop. Mystic Spirals designed the kits as Fighting 15s requested so that they are elegant 28mm figures, not chunky, and accordingly they are fiddlier than usual to assemble and experience of putting together white metal kits is therefore an advantage. Swords have been designed to be exaggerated, but are intended to be painted as “force blades”. The figures were intended for a personal HOTT project. Figures are priced at £3.00 each including VAT.